How to fit into a site at the heart of an overall restructuring project on a city-wide scale and design an extension on an already very crowded plot of land? 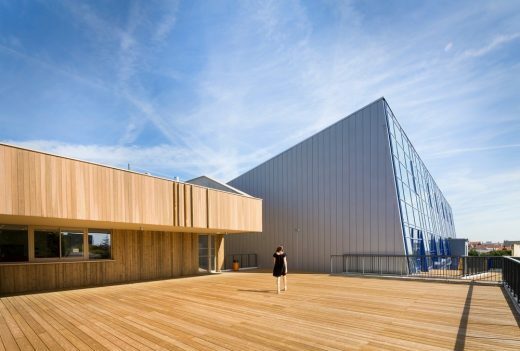 As one consistent entity, the Sports Centre pulls together a large number of elements from different briefs, i.e. 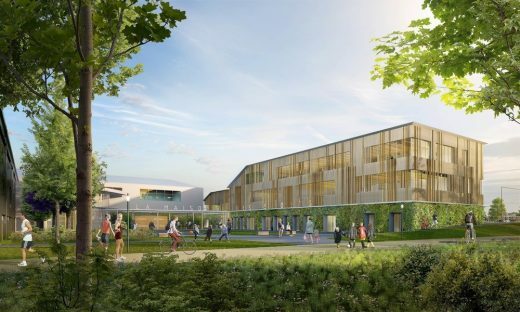 an already-existing gymnasium, swimming pool and indoor tennis courts with the creation of a multi-purpose arena, a boxing hall, a bodybuilding hall, two dojos, a football pitch with stands, outdoor tennis courts and a clubhouse. The new building fits in as a unique wing to the west of the existing L-shaped buildings, unifying the whole in a U configuration. This creates an inner courtyard, a genuine place to breathe between buildings and a generator of light that unifies all access points. 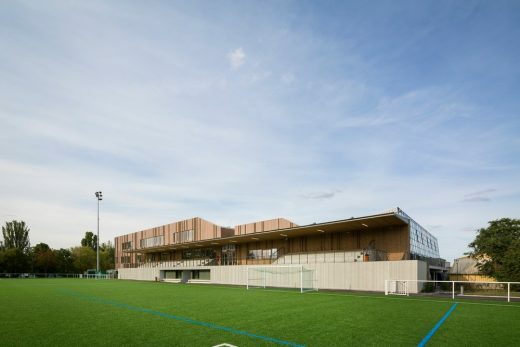 • A two-floor hanging timber building that contains the sports halls and stands on the green base like lanterns. The new building is located in the extension to the park that occupies the north portion of the plot. Like an extension of this park, the ground floor is composed of an anti-graffiti glazed concrete facade doubled by a hedge of climbing plants, 50 cm thick at a height that corresponds to that of the entrance hall. This green base divides the building in two and lightens it. Composed of plants requiring little maintenance, it isn’t a plant wall but a hedge growing from the ground. The non-invasive creepers grow up the trellises to the first floor without causing harm to the building in front of which they stand. 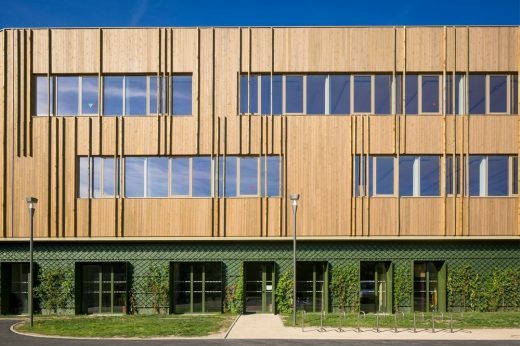 The wooden centre stands on the green base, two constituent floors of the building (reception, offices and sports rooms) totally clad in timber. 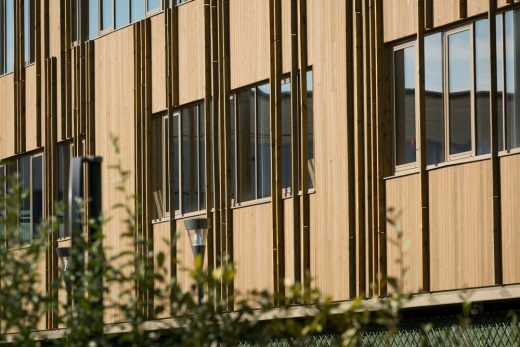 The facades are livened up by large timber spines that give rhythm to the cladding’s shadows and extra thickness. They are generously glassed on the two best orientations favourable for practicing sport, i.e. the north and northeast, allowing athletes to enjoy a bright, open atmosphere that gives onto the park. 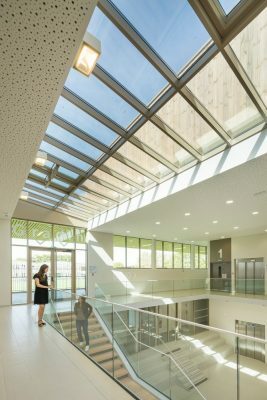 With its generously glassed-in facade and roof, the central entrance hall lets in natural light to the core of the Sports Centre. 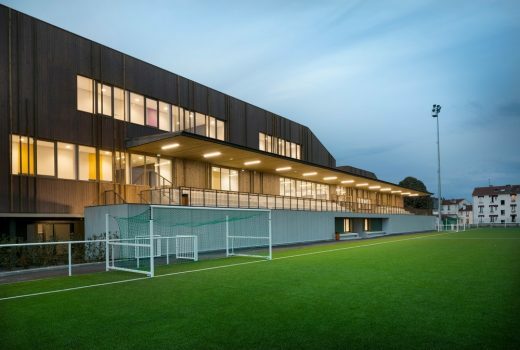 Being walk-through, it offers an uninterrupted view of the football pitch, and its double height (nearly 8 m) creates an immediate rapport with the bar on the first floor. The caretaker’s lodge, located very near the entrance, and a wide reception desk in the hall make it possible to monitor the access points and guide visitors. On the ground floor the hall gives access to the bodybuilding room, toilets, offices and premises for sports associations. 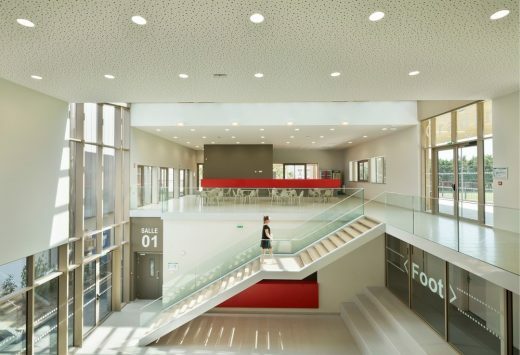 With the lift and central staircase, it links all the sports rooms located on the upper floors. • towards the terrace, an extension of the swimming pool’s sun deck. The stands are arranged so as to allow a wide, same-level platform with the bar, making it possible to watch matches with a panoramic view from inside. 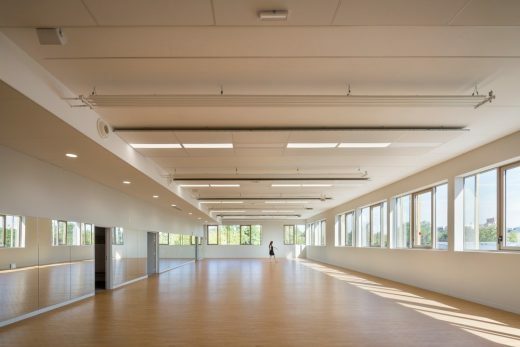 Located on the first and second floors, the sports halls all enjoy north and north-east exposure for a homogenous, soft light. The dojos are lined with cushioned walls. The other halls are lined with head-high acoustic panels. 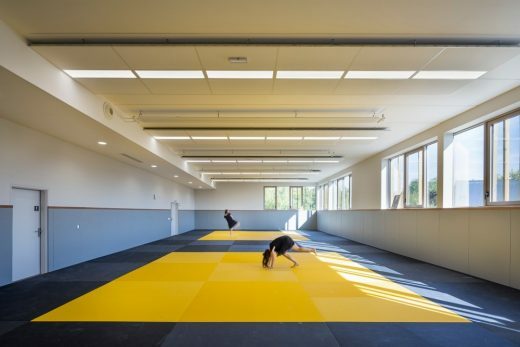 The halls are built with pre-poured concrete slabs providing the sports areas with handsome volumes without intervening pillars. 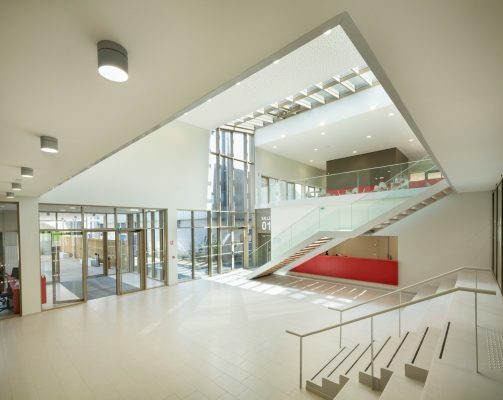 The ceilings are offset, enabling the insertion of light fixtures and acoustic panels between the slabs. Each hall has two exits and areas for changing rooms and storage space. The changing rooms located on all floors of the Sports Centre are walk-through and adhere to the street-shoe/sport-shoe concept, i.e. people enter the changing rooms with dirty shoes and emerge in the sports halls with clean shoes. The changing rooms are often grouped by two to limit the need for service ducts and to pool the wet areas (showers, toilets, etc.). 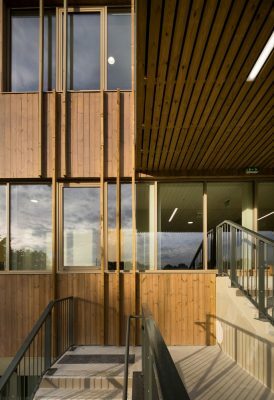 The hallway leading to the sports halls is also located on the facade side, giving rise to well-lit, friendly foot traffic and a panoramic view of the outdoor sports fixtures. The bodybuilding gym has direct access to the entrance hall and is wide open to the outside. It has a glass wall onto a small patio created along the swimming pool facade by a hedge that reproduces the base principle of the Sports Centre. It forms a kind of landscape in front of the bodybuilding room. The football pitch has been laid over a previous one, making it possible to conserve part of its original shape whilst enlarging it. It also made it possible to place the stands up against the building. The roof over the stands is composed of a light frame supporting a metal cover with timber cladding on the under side. 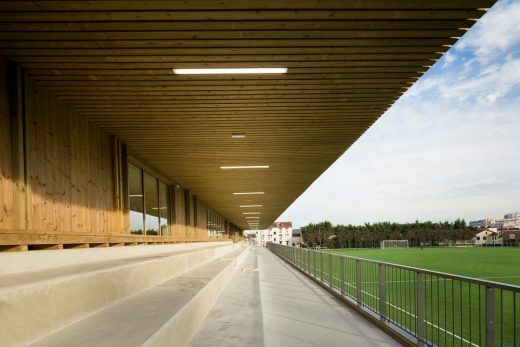 Although the stands’ 300-seat capacity abuts against the Sports Centre’s building, it is entirely independent in its use. 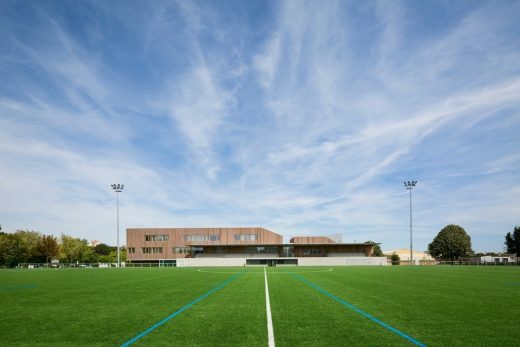 The running track has been located between the football pitch and the tennis courts, enabling the separation of the two areas and preferential access. Three new tennis courts have been placed at the end of the plot with the best possible sun exposure for play. The clubhouse is located near these new courts so as to create a tennis hub. A path enabling access for people with special needs makes it possible to reach the already existing indoor tennis courts via a landscaped passageway. The sun deck has direct access from the swimming pool and on a level with the door to the pool. It faces directly south to take full advantage of the sun. A space for snacks is located closely nearby on the terrace outside the bar-cafeteria. 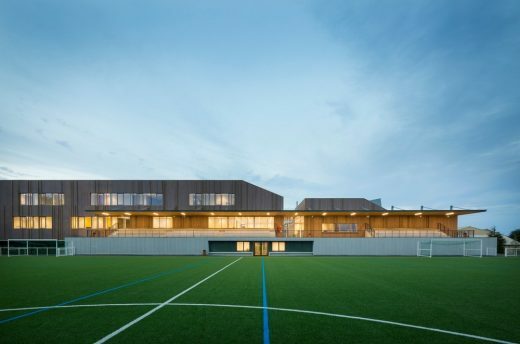 The Sports Centre combines a wide variety of elements from different briefs, i.e. 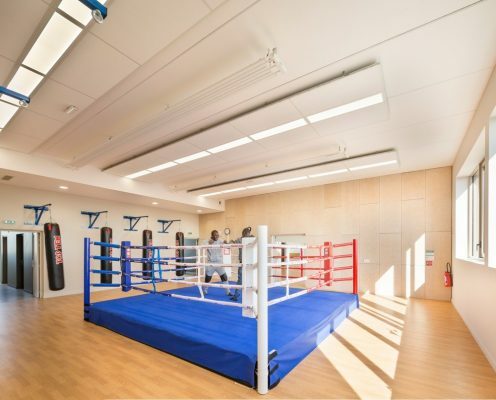 already existent gyms, swimming pool and indoor tennis courts with new all-purpose halls, a boxing gym, a bodybuilding gym, two dojos, a football pitch with stands, outdoor tennis courts and a clubhouse. 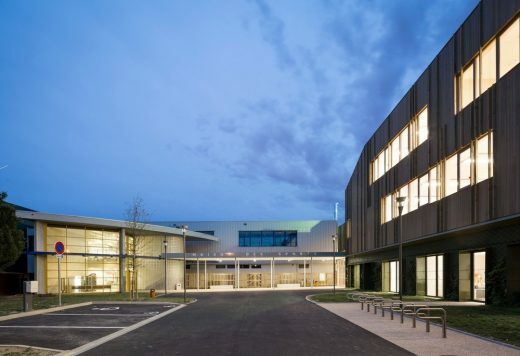 The new building is located to the west of existing buildings, uniting the whole with an entrance hall that acts as a bridge to all the facilities. 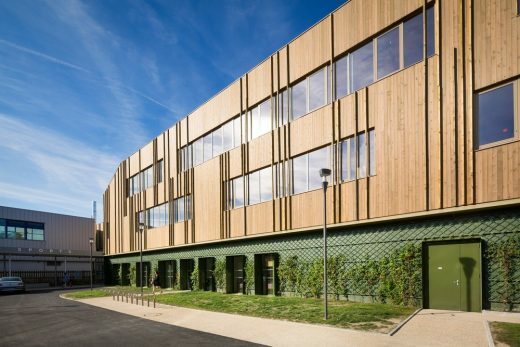 A ground-floor green base supports a “wooden house” that contains the sports halls. Bathed in natural light the entire building offers warm and functional spaces. 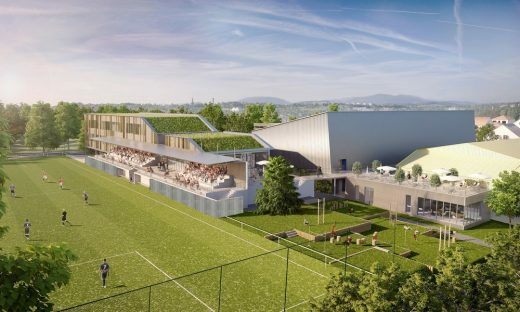 Programme: multi-purpose arena, boxing hall, bodybuilding hall, two dojos, a football pitch with stands, outdoor tennis courts and a clubhouse, hall, bar, changing rooms.